When I saw Curtis Stone make his Coq au Vin dish on Take Home Chef I thought I could never make that. Was I wrong. I made it and it was delicious! As the ingredients were put together it smelled so good while I was cooking it! I used Trader Joe’s Riesling under $5. I was pleasantly surprised what a great-tasting wine this was. I never buy Riesling and now I’m glad I did. It’s a wonderful wine for both cooking and drinking. Aromatic, dry, crisp with a slight softness to it with complex flavors. COOKWARE: You will need a large enameled cast-iron casserole (French Oven/Dutch Oven). Typical size French Oven is 6 to 6.5 quarts. 1 pound mixed mushrooms, sliced – I used cremini, shiitake and baby portabella. TIP: Chop the onion, carrot, celery and shallots in a blender. Preheat oven to 300° F. Season chicken with salt and pepper. In your casserole, heat 2 tablespoons grapeseed oil over moderately high heat. Add half of the chicken and cook, turning the chicken legs until browned 8 to 10 minutes. Transfer chicken to a plate. Cook the remaining chicken. Pour out any excess fat and wipe out the casserole. Heat remaining 2 tablespoons grapeseed oil in the casserole. Add the onion, carrot, celery and shallots and cook over medium heat, stirring until vegetables are softened and lightly browned about 8 minutes. Add the wine and simmer for 1 minute. Add the chicken broth and thyme and bring to a boil. Nestle the chicken in the casserole. Cover and braise in the oven for 1 hour until tender. Meanwhile, in a large skillet, melt the butter in the olive oil over medium-low heat. Increase heat to high and add the mushrooms and cook until browned 5 minutes without stirring. Season the mushrooms with salt and pepper then stir and cook until tender 3 to 5 minutes. Transfer to a plate or bowl. Transfer the chicken to a plate. Strain the braising liquid through a fine sieve into a cooking pot (or a bowl as long as it is heatproof), pressing on the solids and skimming off any fat. Return the braising liquid to the casserole and over the stop top bring to a boil uncovered until reduced to 1-1/2 cups, about 5 minutes. Whisk in the crème fraîche and lemon juice and season with salt and pepper. 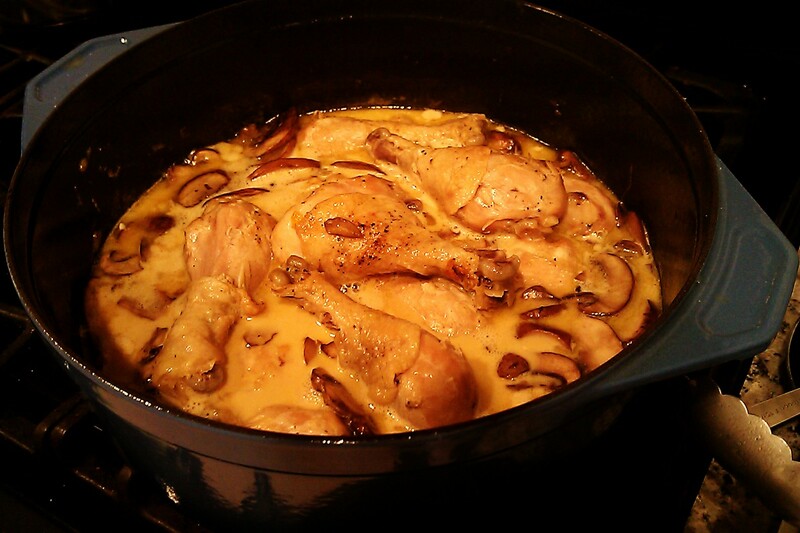 Add the mushrooms and chicken to the sauce and simmer for 5 minutes. Sprinkle with dried oregano and serve. « Peaches falling off the tree? Don’t waste them, share on Playndirt! Riesling pairs well with chicken for cooking. And oh, love whatever Curtis Stone does! Trader Joe’s’ is great place for wine. I’m a fan of them. This dish looks divine. I bet it tastes even better! Thanks! I was on a Curtis Stone marathon a few months ago. It was my treat every night after a long day. He’s fun to watch and I agree … you must cook and sip wine at the same time! Looks rich and delicious. I discovered Riesling by accident too but really enjoyed it – so good with Asian food. Asian food? Do you have a recipe of one? Oops … I think you meant pairing it with Asian food. LOL. 🙂 I did, but now you mentioned cooking with it, I wonder…..
Oh this looks so good. I only seen it done with chicken breasts but definitely like the legs much better. I should just always but a whole chicken because my husband likes white meat and I prefer dark which I think has more flavor and isn’t as dry. Oh, how delicious that looks! Beautiful! What a perfect fall dinner this will make. I always buy my cooking wine at Trader Joe’s. Good quality wine for the price. To cut back on my wine spending I decided to buy wines under $6. (Really!) I’ve done really well sticking to my wine budget and have found really great wines at Trader Joe’s for $6 bucks and under. Oftentimes better than the pricier wines!